If you are in the market for a new vehicle, you may be thinking about an SUV. At Better Way Auto Superstore, our SUVs are popular vehicles because they offer a number of advantages. Let's check out some below. 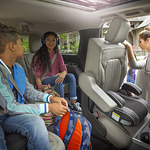 SUVs are ideal for consumers who need plenty of passenger space and cargo volume. There are some that offer third-row seats, which can be folded down for more cargo space. SUVs are also more accommodating to pet owners. The cargo bay area offers plenty of room for pet carriers, and you can also buy a pet barrier to help keep your pet secure. There are even some automobile manufacturers that offer dog-friendly editions of SUVs. SUVs also offer more capability than smaller vehicles. SUVs are equipped to tow boats, motorcycles, campers, and more. They also offer a better off-road experience with sturdy suspension systems and a higher ground clearance than other vehicles. In addition, SUVs can offer features, which include traction management and hill decent control, for enhanced capability.